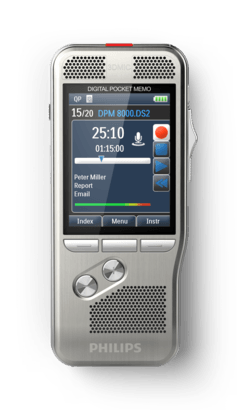 The PocketMemo Voice Recorder takes dictation to a new level. Breakthrough 3D Mic technology delivers best audio quality in any recording situation. Its robust yet lightweight stainless steel design offers perfect ergonomics for working over longer periods of time. Coupled with SpeechExec Pro software for efficient data management and a docking station for uploading your files, going from your voice to your text document has never been quicker. The breakthrough 3D Mic technology uses the built-in microphones to always deliver best recording results: an omnidirectional microphone offering 360 degree sound pick-up, ideal for the recording of multiple sound sources such as meetings, and a unidirectional microphone optimized for voice recording and accurate speech-recognition results. The built-in motion sensor senses when the device is placed on the desk or held in the hand and selects the microphone accordingly to suit the recording situation. The motion sensor switches automatically into standby mode when the device is idle. Once the Pocket Memo is picked up again, it’s ready to record within seconds. The quick-response and ergonomic slide switch is designed for singlehanded operation of all recording and playback functions, allowing easy and quick file editing (insert, overwrite, append). It operates with a light sensor signal, making it wear-free and durable. The asymmetrical and ergonomic shape fits perfectly into your hand. Its slim and lightweight design maximizes comfort, even when working over longer periods of time. The brushed stainless steel creates a robust and highly durable protective shell around the device. The device is shockproof according to US military standard 516.6. The SpeechExec Pro software organizes the workflow of dictation files and resulting documents between author and transcriptionist, and allows you to monitor the status of your work. The large full-color display offers sharp images, making it easier to see everything at first glance. The clear user interface is optimized for easy, intuitive operation. The stable and superior docking station provides speedy charging and automatic transfer of your recording to your computer. With an optional foot control connected, the docking station enables hands-free recording and transcription even without a computer. The high-capacity Li-ion battery can be easily charged through a standard micro USB jack. The integrated light and motion sensors guarantee extended battery life. The smart technology adjusts the brightness of the display and switches automatically into stand-by mode when the device is idle, ensuring that your recorder will always be ready to work when you are. Recordings can be encrypted in real time using the Advanced Encryption Standard (AES or Rijndael Algorithm) with a key length of 256 bits. AES provides a very high degree of security and has been approved in the USA for the most highly classified government information. The device itself can be assigned a PIN code to protect against unauthorized use or file playback. The integrated barcode scanner enables you to link client or patient data to a recording by simply scanning over a barcode, even from a display. * This ensures reliable assignment of client or patient IDs and speeds up your workflow. The Philips SpeechExec Remote Device Manager software allows IT administrators to centrally manage, configure and update dictation hardware from Philips, saving valuable time and resources. Managing device settings for individuals, groups and teams or the whole organization is easily done remotely. Many users still love their analog devices for their simplicity and userfriendliness. The optional classic mode gives the user the look and feel of working with an analog device while retaining the advantages of digital technology and keep focused on the essentials.